Webster defines procrastination as "the habit of procrastinating”, and isn’t that just like him? He makes you go back and look up "procrastinating” yourself because he never got around to doing it for you, and when you get right down to it, that pretty much sums up the whole concept right there. Interesting, too, that Mr. Webster chose to describe it as "the habit of procrastinating”, lumping it in with all those other nasty habits – you know, like the habit of eating pencil erasers or the habit of digging around in your ear and then examining the ear wax under your fingernails – when he could just as easily have gone with "the act of” procrastinating or "the practice of” or better yet, "the art of”. Personally I prefer that one. "The art of procrastinating”. It implies that a talent is involved, and frankly, that makes me feel a whole lot better about how often I do it. And now, having established the definition, I would like to move on to identifying the true procrastinators – or artists – among us, so that we may join forces and collectively never get around to doing anything together. Toward that end I have devised the short quiz below to help you determine whether or not you meet the criteria. But before we get started I feel it’s important to note that everybody puts things off to some extent (I mean, show me a woman who doesn’t drag her feet just a little bit when it comes to picking up the phone and scheduling a routine colonoscopy and I’ll show you a woman who apparently will do anything to lose a quick couple of pounds) but that’s not really what I’m talking about. My focus today is on those of us who have elevated the craft to a point where it would never occur to us to rinse pancake syrup from a plate in its fresh liquid state. Ours is the habit, I mean, art of waiting until that syrup has achieved epoxy-like properties and must be chiseled off with a putty knife. If this describes you, I’ll bet I can guess your final score. I’ll also bet you are going to spend a lot of time on this quiz, if for no other reason than to further delay folding the last four loads of laundry you’ve dumped on the sofa. You may now begin. B. You typically dismantle the tree while watching football bowl games, which means everything’s back in attic shortly after New Years. C. Okay, so it’s the Super Bowl and you’re still putting stuff away. Is it your fault they have so many playoff games? D. What?!? Your tree is still up? May I remind you that this is the JUNE newsletter? B. "Fall Back” and "Spring Forward” for Daylight Savings Time is a mental reminder for you to check your smoke detectors and schedule a visit with the dentist. C. When you dislodge a small pot roast from between your teeth one night while flossing, you figure a good cleaning is overdue. D. Your most recent memory of being in a dentist’s office includes reading "Goofus and Gallant” from Highlights Magazine. A. Every time you pull into a gas station you pop the hood and check your oil. B. You examine your dipstick every 5,000 miles, or whenever your dealer sends you a reminder card. C. That’s what husbands are for. A. 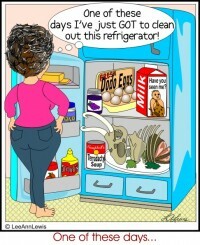 You operate on a FIFO system (First In, First Out) with dated labels and a strict three-day limit on leftovers. B. Every two weeks the contents of those butter containers are opened and evaluated. C. When your lettuce turns from a solid to a liquid, and your milk from a liquid to a solid, that’s your cue to toss them in the garbage. D. Is that a turkey carcass from last Christmas I see on the bottom shelf?!? Again, may I remind you that this is the JUNE newsletter? A. Your surplus supply of hormone pills would provide enough estrogen for a women’s correctional facility. B. You draw a line near the bottom of the bottle and when the pills fall below that line it’s time to reorder. D. Violent mood swings from running out of hormone pills are what landed most of those inmates in that women’s correctional facility in the first place, and you’re on the verge of joining them. 6-15 – Obviously you have a very practical, sensible and reasonable approach to just about everything you do. Bully for you. 16-19 – You’re skating on pretty thin ice here, sister. Let me guess. You keep meaning to remind yourself to get around to making a note to put on your calendar to seriously think about catching up, but you keep putting it off. Ditto me. 20 – Okay, this score can only be accumulated if you answered "D” on every question. In that case, Wow. Even I’m impressed. Search for Newsletter articles similar to "You Call Me a Procrastinator Like It's a Bad Thing. Search all articles similar to "You Call Me a Procrastinator Like It's a Bad Thing".